Poor connectivity not only results in onerous travel schedules, it also holds economies back by hampering the development of air transport in general. Past initiatives to open up Africa’s skies, such as the 1999 Yamoussoukro Decision, have remained largely unimplemented. An IATA-commissioned study has used statistical modelling to illustrate the enormous potential economic and social benefits of opening up Africa’s air transport sector to greater competition. In 1969 Neil Armstrong and Buzz Aldrin flew directly to the moon. In 2017 Google founder Sergey Brin will fly directly to the International Space Station and in 2026 a group of space pioneers will fly directly to Mars. To travel the 2500 kilometers from Algeria to Cameroon, two countries on the same continent, the most convenient route is currently via Istanbul and involves three separate flights. The minimum journey time is 24 hours but can be as much as 30 depending on connection times (Map). This is truly a disturbing paradox of our age. Poor connectivity in Africa is not just about inconvenient travel schedules. It also damages the economies of Africa’s fifty-four nations and the region as a whole by hampering the development of air transport across the entire continent. Freedoms of the Air, cabotage, and foreign ownership are all very highly regulated in Africa. Aviation has the potential to make a huge contribution to economic growth and development across the continent and to open up and connect markets, facilitate trade and enable African firms to integrate global supply chains. Enhancing air connectivity can help raise productivity by encouraging investment and innovation and by improving business operations and efficiency. Air transport is indispensable for tourism which requires convenient air services to facilitate the arrival of large numbers of tourists in a region. It is also vital for transporting perishable goods from African countries to markets all over the industrialized world. Yet, while the merits of aviation are widely known, non-physical barriers continue to obstruct the development of inter-African air transport. These obstacles mainly stem from protectionist policies favoring ‘national’ airlines dating from the early 1960s when many newly-independent African states created national carriers, in part to assert their nationhood. But why, some 50 years later, does this situation still persist in Africa? 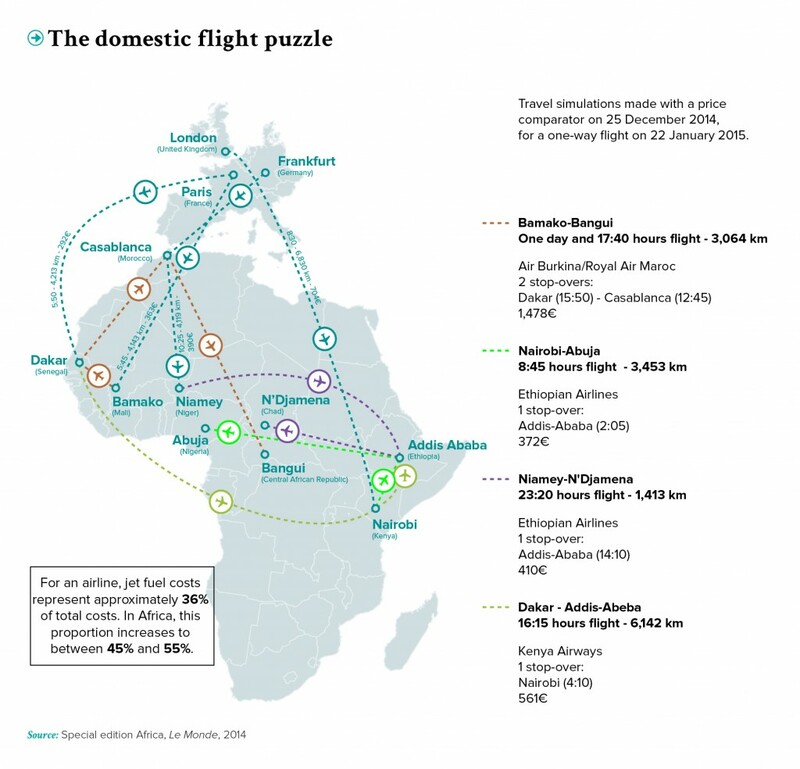 These factors are by no means unique to African aviation, however, more mature markets have fully embraced the benefits of greater connectivity and moved towards more liberal domestic and international regulatory frameworks. The European air transport industry today is radically different from the highly regulated pre-liberalised (1988) one that was dominated by national carriers and state-owned airports. It took three successive packages of legislation driven at European Union (EU) level to open up the market. The effects were staggering. European air traffic surged following liberalisation. Between 1992 and 2000, the number of scheduled routes between European countries increased by nearly 75%, the number of flights increased by 88% and the number of seats offered more than doubled (ICAO, 2006). Increased competition also resulted in lower ticket prices. In real terms, average ticket prices fell by more than 15% over this period. Improved connectivity has also benefitted developing nations in Latin America. Chile’s air industry, for example, witnessed unparalleled growth following liberalisation in 1979. Air traffic in Chile increased at rates significantly higher than regional and world averages. Likewise in Costa Rica, air transport liberalisation saw tourist arrivals quadruple over 20 years and the number of air carriers serving the country almost tripled (ICAO, 2006). In Brazil, low-cost carrier start-ups prospered in a liberalised commercial environment, leading to additional routes and lower fares which in turn opened up new markets. African governments have not been totally impervious to the benefits of improved connectivity and liberalisation initiatives exist at bilateral, regional and continental level with a view to improving air transport across the continent. Many African countries adopted the Yamoussoukro Decision (YD) in 1999, championed by the United Nations Economic Commission for Africa (UNECA) as part of its role in improving intra-African trade and commerce. The main purpose of the YD was to open up intra-African air transport services in terms of access, capacity, frequency and tariffs. It was designed to promote co-operation among African nations and to develop regional air travel in line with other parts of the world. This agreement committed the 44 signatories to deregulating air services and opening up regional air markets to transnational competition. The agreement was a follow-up to the similar Yamoussoukro Declaration of 1988 which lacked the necessary framework and dispute resolution arrangements, thus hindering its successful implementation. YD is supposed to be a binding agreement but so far its implementation has been slow and restricted. According to a recent study commissioned by IATA, this is because of protectionist policies favoring national airlines, such as the provision of government subsidies, practices that discriminate against carriers from other continents, severe restrictions on African carriers placed by EU safety regulators inter alia and non-physical barriers such as visa and other documentary requirements (InterVISTAS, 2014). Often non-African airlines have been granted traffic rights that are denied to African operators. A number of African states have refused to open their skies to each other but have done so for carriers from different continents. Twenty-three African states have signed open skies agreements with the USA but not one has opened its skies in compliance with the YD (AFRAA, 2014). Furthermore the absence of an oversight authority, dispute resolution mechanisms and competition regulations provided for in the text of the decision has stalled implementation. There has been a lack of accountability over failures to implement the agreement and there is no fair competition watchdog. However, the situation is changing. In 2015 the African Civil Aviation Commission (AFCAC) was designated as the oversight authority and dispute resolution mechanisms and competition rules have now been adopted. Another major challenge has been the lack of awareness of the economic benefits of full implementation of YD. There has always been great concern that increased connectivity could harm the commercial viability of existing carriers or even put them out of business as it levels the playing field. IATA decided to tackle this lack of awareness head-on by using statistical modelling to illustrate the economic benefits of the decision’s implementation. The model forecast traffic between two African countries based on the two nations’ levels of trade, economic characteristics, geographic relationship and existing bilateral air service agreements. By identifying changes to the terms of the bilateral agreement, the model was able to estimate the traffic impact resulting from improved connectivity. Air traffic flows between 12 African countries (Algeria, Angola, Egypt, Ethiopia, Ghana, Kenya, Namibia, Nigeria, Senegal, South Africa, Tunisia and Uganda) were analyzed. 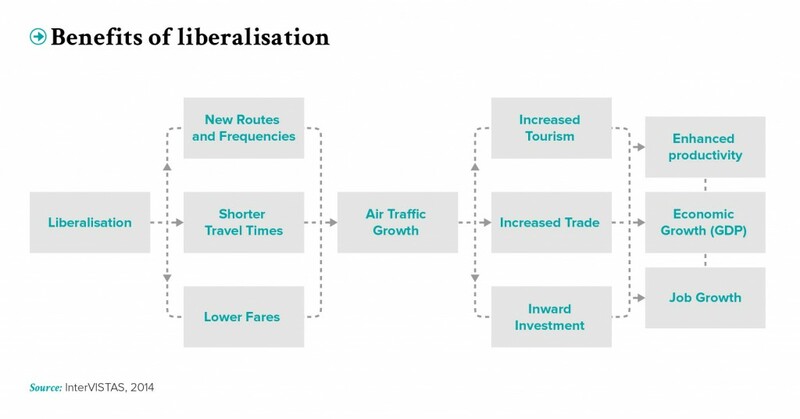 The IATA report clearly demonstrated that enhanced connectivity between African States would generate economic and social benefits (Figure). Complete air connectivity across these 12 countries would add USD 1.3 billion to GDP, create over 155,000 new jobs and generate numerous other socio-economic benefits (see SPOTLIGHT). Approximately 5 million passengers who cannot currently afford air travel would be able to do so as increased competition among airlines would cut fares by between 25% and 35%. There are also additional benefits in terms of time savings. It is important to note that there are currently several successful liberalisation initiatives in Africa. The agreement to open up the air travel market between South Africa and Kenya in the early 2000s led to a 69% rise in passenger traffic. Allowing low cost carriers to operate between South Africa and Zambia cut fares and boosted passenger traffic by 38% in each case. Ethiopia’s pursuit of reciprocal bilateral open skies agreements have made the national airline one of the largest and most profitable in Africa. Research has found that on intra-African routes with more liberal bilateral arrangements, passengers have benefited from both lower fares and more frequent services. Ethiopian Airlines has demonstrated that African carriers can thrive in a more open environment. A major obstacle to the implementation of the YD was a lack of awareness of its benefits. Key aviation stakeholders and policy-makers in African nations now have compelling evidence of the strategic socio-economic benefits of a well-connected continent. Following publication of the report, 13 African heads of state have re-affirmed their commitment to its immediate full implementation. The transport ministers of these countries have met and developed a comprehensive implementation plan. IATA has also received requests for additional studies from the African Union (AU) and the Common Market for Eastern and Southern Africa (COMESA) to cover more countries in AFI. While the building blocks are in place for increased connectivity across Africa – underpinned by the Yamoussoukro Decision – underlying problems need to be addressed. Governments in Africa need to start treating aviation as a strategic asset and not as instruments of foreign policy. In too many cases national policy continues to revolve around protecting the national carrier. Africa is poised to reap the rewards of an exceptional period of growth and opportunity and it needs to ensure that aviation is at its core. Comprehensive connectivity and greater market access would transform African aviation and stimulate its economies. Surely if we can fly people directly to the moon we can work together to connect African nations within a single continent.